Self-Driving vehicles are considered as the future of cars. South Korea is taking a big step into the self-driving vehicles development space, is now building the largest ‘fake’ city for testing self-driving vehicles. In the fake city Dubbed as K-City, the self-driving car developers can repeat tests with various scenarios and road conditions. The facility will take up across 360,000 square meters, effectively making it the biggest in the world. It will be loaded up with expressways, bus lanes, parking lots and other areas autonomous cars will need to learn to navigate. You can also review other self-driving car at Autoxpedia. This K-City, is going to be available for companies like Samsung, SK Telecom, Hyundai, Naver and Kia for testing their self-driving vehicles. Samsung recently received approval for testing out autonomous vehicles, and is just the latest technology firm looking to get into that space. Samsung also have approval from the South Korean government for testing their self-driving cars on the road. Samsung is a firm that seems to have their hands in just about every area, from making components to tablets, to smartphones and even parts for cars (similar to LG, from South Korea too). 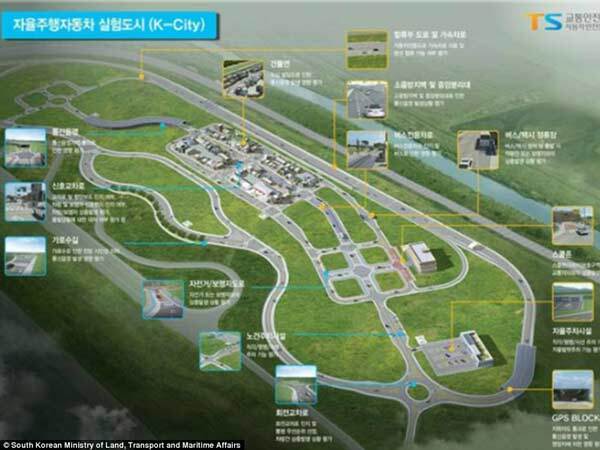 Currently, the world’s largest K-City is under construction based on the intelligent transportation system of the Korea Transportation Safety Authority. The city will be spread about3,60,000 square metres. The K-City will be equipped with autonomous car parking zone, expressways and bus lanes. A budget of around 11 billion won is planned to be invested in the project. Expressway testing will start in October this year, with the rest of the facility opening by mid of 2018. This date of starting is well earlier than the originally planned, that showing just how crucial self-driving technology has become to companies just over the last year. The biggest K-City in South Korea will definitely be a big help for Hyundai, Samsung and many other companies in South Korea.